Xenophobia is a fear of that which is unknown or different from oneself. It comes from the Greek words xenos, meaning "stranger," or "foreigner" and phobos , meaning "fear". Xenophobia is typically used in the context of human territoriality, particularly on a communal scale or larger. It differs from racism in that someone can be xenophobic about those of the same race, language, customs and belief systems. All that is required is that they come from someplace different than the one who is xenophobic. However factors that distinguish ethnic or cultural groups from one another tend to amplify the fear. In modern times, xenophobia has also become associated with the concept of extraterrestrial visitation, manifesting itself in the form of alien invaders. 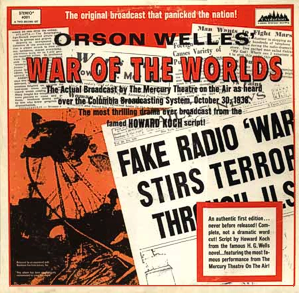 On October 30, 1938, the Columbia Broadcasting System aired a radio adaptation of The War of the Worlds, a novel published by H. G. Wells in 1898 that portrayed an invasion of England by aliens from Mars. Although the novel had caused no pubic concern, the radio adaptation by the Mercury Theatre was scripted as a series of newscasts for listeners in the USA. The docudrama style caused many listeners who had tuned into the show between credits to temporarily believe they were listening to real-time events. Many became curious and started calling the authorities to verify the events. Others went out to investigate for themselves, only to find the roads jammed with drivers who had gone out to do the same thing. Newspaper reports during the following days spun the confusion into tales of panic, which in-turn sparked a Federal Communications Commission inquiry. Because the element of panic was largely exagerated and sensationalized by the news media for the sake of grabbing audience attention, the incident became a vehicle for xenophobic propoganda used to rationalize the non-disclosure of UFO related information.